Starring actor Christopher Clark reprises the role that his father performed years ago. 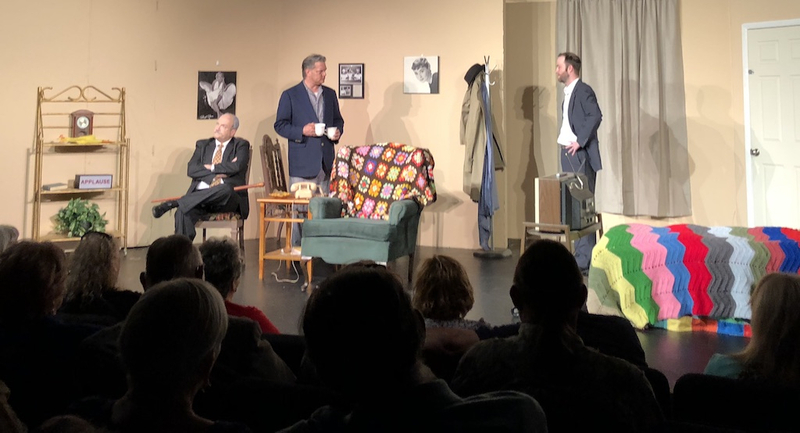 Sapulpa Community Theatre’s production of Neil Simon’s comedy The Sunshine Boys is a more-than-enjoyable way to spend a couple of hours on a weekend. I laughed, I cried, and I left loving and appreciating community theater and its actors even more than I already did. Directed by Sherry Whisman, the play revolves around two semi-retired vaudevillian actors who, although once partners and the best of friends, have not spoken to each other in over eleven years. A CBS special focusing on comedy throughout the ages brings the two reluctant men back together for a hilarious, but poignant, reunion. The pace in the first act feels a little slow, but the anticipation and action builds well and flows throughout the rest of the show. The acting was excellent, the New York accents were particularly impressive. The standouts were Christopher Clark as Willie Clark, Monte Hunter as his nephew, Ben Silverman, and Kerry Kavanaugh as Willie’s registered nurse, although the whole cast was fabulous. Christopher Clark, who plays Willie Clark, one half of the comedic “Lewis and Clark” duo, reprises the role his father, Sapulpa Community Theatre founder John B. Clark, played years ago. He is the clear star of the show and plays both the slapstick and tender parts equally well. Willie is furious with his former partner, Al Lewis, for retiring years ago and leaving him without an outlet to act and to make people laugh, and cannot forgive him. It’s touching to watch two “grumpy old men” try to navigate a new phase of their relationship even as they fall right back into the same patterns in which they had always been. It’s clear they needed and missed their old banter and back-and-forth, but their pride will not allow them to admit each other’s importance to one another. The show is about more than two old friends being reunited; it’s about aging, having to let go of one’s life purpose, and one’s struggle with identity when they can no longer accomplish their life’s work. Willie’s RN is played by Kerry Kavanaugh, a six-show veteran of SCT. She states, “I never really thought I was funny! But it’s been so much fun to do funny roles. I think for my character, eating chocolate made the character!” If you’ve never thought that words beginning with a “T” are funny or that watching someone pick and choose pieces out of a box of mixed chocolates is hilarious, then you haven’t seen The Sunshine Boys. Get yourself there this weekend, before it’s too late! Showtimes are Friday, May 4 at 7:30 p.m., Saturday, May 5 at 7:30 p.m., and Sunday, May 6 at the 2 p.m. matinee. Tickets are $12 for adults, $5 for students K-12th grade, and there’s a $10 group rate for groups of 10 or more. Special seating arrangements can be made by calling the theater at: 918-227-2169, and more information can be found on their website: www.sapulpatheatre.org. Featured Image: From left: Steve James as Al Lewis, Christopher Clark as Willie Clark, and Monte Hunter as Ben Silverman.